Look! I still knit sometimes. 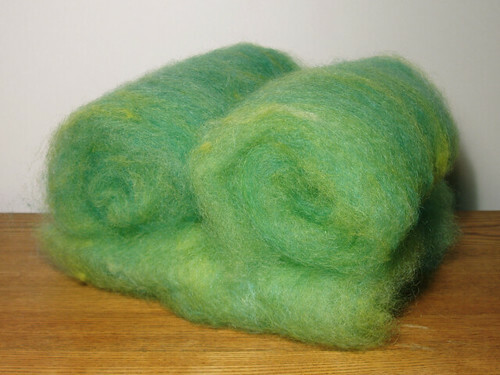 And not only that, but the green yarn was spun from a batt I carded using my new Strauch drumcarder. 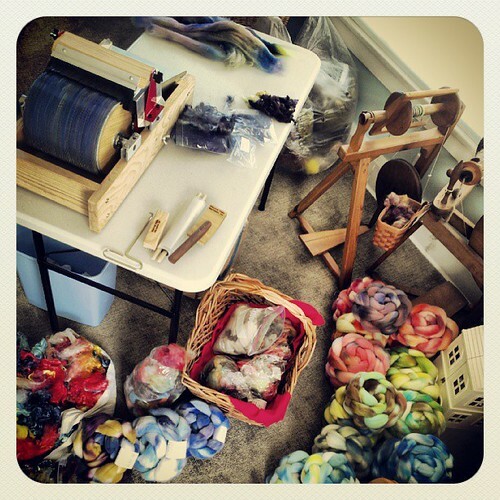 It was the first time I went from beginning to end with a batt: carding – spinning – knitting. So exciting! It’s mostly wool, but there’s a bit of mohair, silk, and firestar in there for a bit of spice. 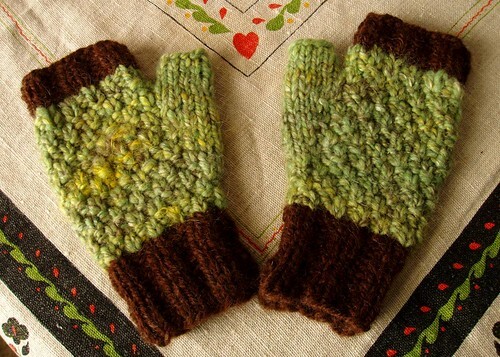 I used moss stitch for the body of these mittens with a ribbing of handspun natural wool at the cuffs. Quick and easy. It’s done. I finally went through the part of my hideously massive stash that consists of weird bits and pieces, odds and ends — the left overs. 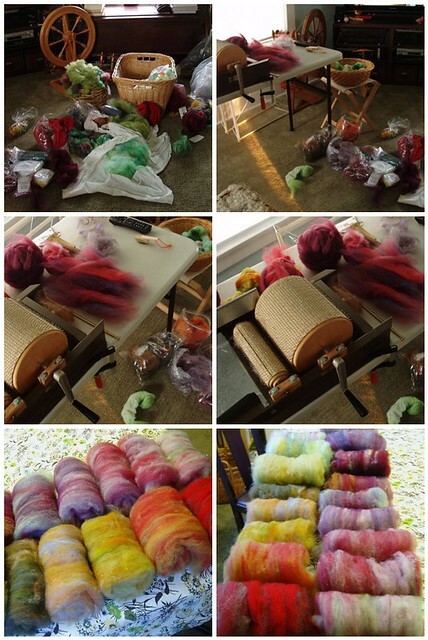 It made sense to work on it this week since I’d already pulled a lot of the stuff out into the living room for batt-making. Really, that photo doesn’t even give you an idea of it. All of that stuff is keepers! And sure, I could slowly churn through these left-overs, incorporating them into batts. But in the meantime they take up a lot of space and guess what? There is a LOT of this stuff. Probably more than I could use and more importantly, I’m sick of looking at it. That’s where you get the pleasure of helping me out of this predicament. I put together 14 grab bags. 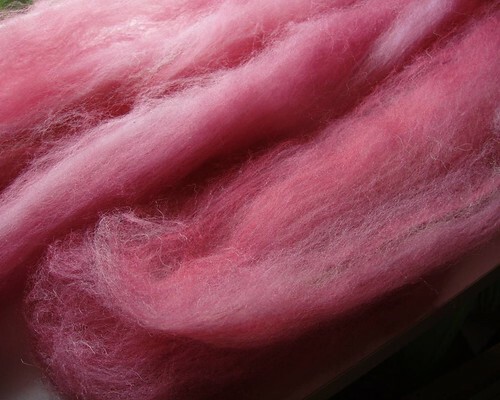 Each one contains assorted fibers, usually two to three different things and ranges in weight from 3.5 to 4 ounces. They are $5 each and are currently listed in the shop. 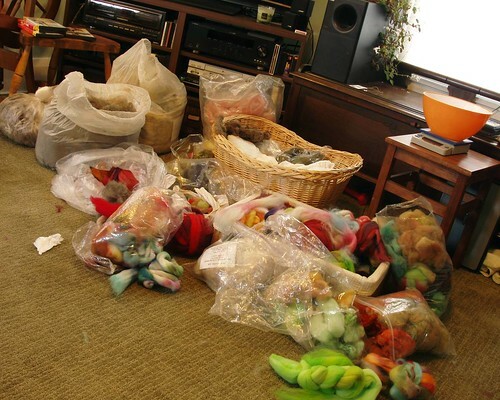 Any that do not sell will travel with me to the Autumn Fiber Festival in October where I will have additional destash items (undyed fiber and tools). Do me a huge favor and get this stuff out of my house! PS. The Grey to Green Festival, scheduled for September 21 in Youngstown, OH has apparently been canceled. 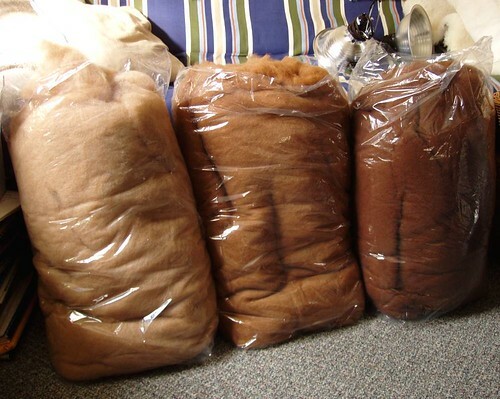 Last fall I went to Stramba Alpaca Farm in Wampum, PA to have some fleeces processed. 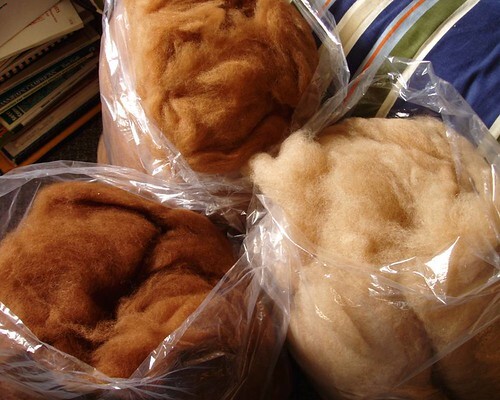 I had collected the fleeces over the course of a few years and they were sitting in my stash with no future. When I heard about a processor that was only 40 minutes from me, I was very excited to take a road trip. They gave me a tour of the mill and spent a lot of time with me. Then we looked through my fleeces and decided to turn them into big, fluffy batts. 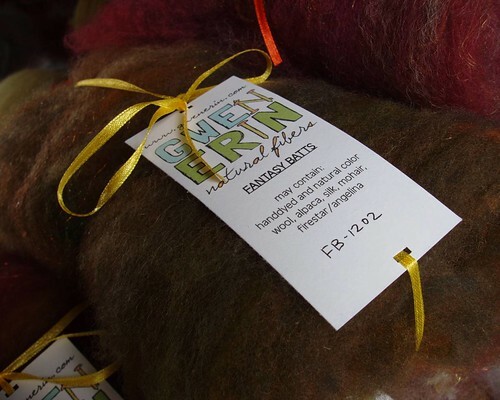 This weekend Terri Stramba was at the Knit & Crochet Festival and she had my batts! They are beautiful and clean and I can’t wait to get spinning. My plan is to create a series of bulky and lofty yarns in lovely natural colors just like the skeins I spun for Irene in September (below). 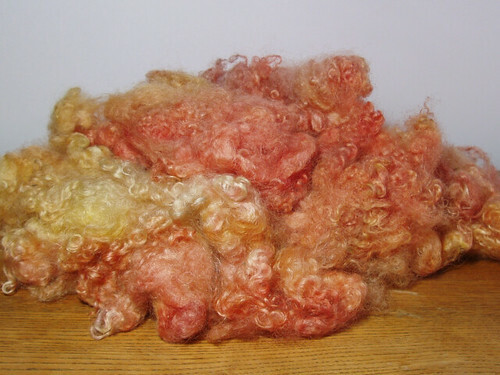 In total I had five fleeces processed and I purposely kept each color separate. There were three shades of brown, one grey, and one black. Each finished bag weighs around 23-26 ounces, but the black is about 36 ounces. That one came from Ross Alpaca Ranch and I’ve had it two and a half years. 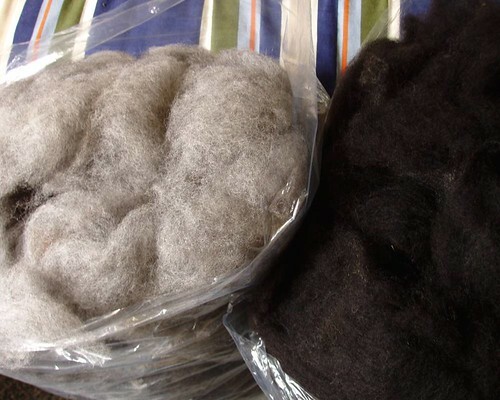 The grey and two browns were from Black Walnut Alpacas. And the other brown was from an alpaca named Gwen (had to buy it! ), but now I can’t remember which one it is. 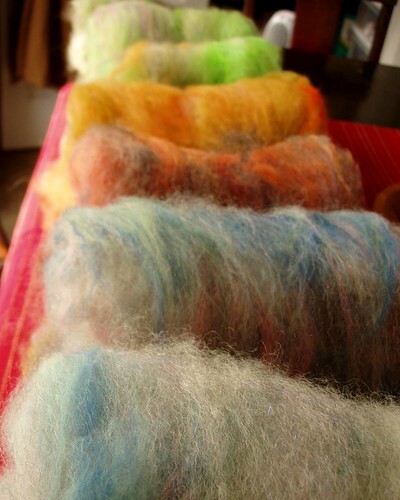 If I have to spin alpaca, this is my most preferred preparation — fluff! When I did my first batch of batts, I couldn’t help comparing them to all those amazing “art batts” that have become so popular in recent years. Mine weren’t as big. Mine weren’t so funky. Mine weren’t the same. And I thought that was a problem. But now, after taking them to a few shows, I realized something. It’s not a bad thing that these aren’t the same as those other ones. They’re just a little bit different and that’s okay. Maybe it’s even a good thing? Sometimes people aren’t looking for a totally wacky looking batt that leads them to the question, “What on earth will I do with this?”. And I guess that’s why I don’t call mine “art batts”. 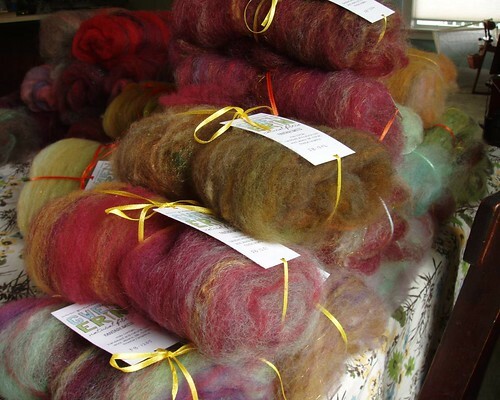 They are more subdued, but still bring a little bit of fantasy to your spinning experience. I’m glad I gave old Whiskers another chance. I’ve had this drumcarder for several years, but never spent much time using it. Now I’d say I’m getting pretty comfortable with the process. This latest batch increased in size significantly (the individual batts, not the quantity). I was getting 1/2-3/4 ounces each, now I’m up to 1 ounce or more. Even though I spent three days making them, I ended up with about 30. It was tiring, but enjoyable. I made a few of each color, which will be good if someone is looking to make a larger skein. I’m considering increasing the price though. Originally I had them set at $3 each or 4 for $10. Now I think I might do $4 each and 3 for $10. I tried taking some video throughout the day, but it was pretty useless. 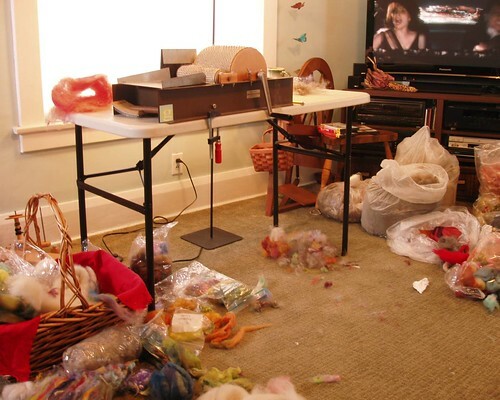 So UPDATED pictures to help you understand the mess that lived in our front room for three days. Generally speaking, I don’t spin novelty yarns. And when I try, they aren’t very novel. So when I do something that is a little different from my normal 2-ply bulky, I get a little excited. 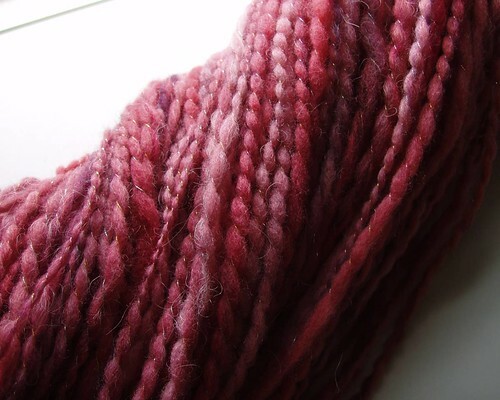 I’m sure the resulting yarn isn’t exciting to anyone else, but at least it was an interesting process. It started when I realized I had far too much pink top floating around and I was getting tired of it. Then I remembered I had this curious little drumcarder that I hadn’t really used for anything yet, so I decided to combine these thoughts into one project. 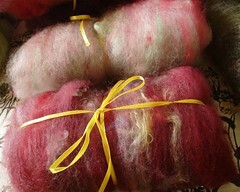 I pulled out some handdyed Falkland top that was, as I mentioned, PINK. Also, I grabbed a handful of white Lincoln roving. The batts did not come out artsy. My intention was to blend the colors in the top rather than having splotches of one thing or another. And the Lincoln added a bit of hairiness (don’t you want that in your yarn?). 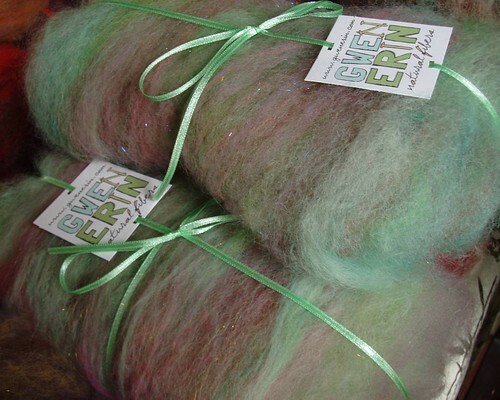 I spun the singles mostly bulky, but with a few thin spots and plied it with sparkling thread. 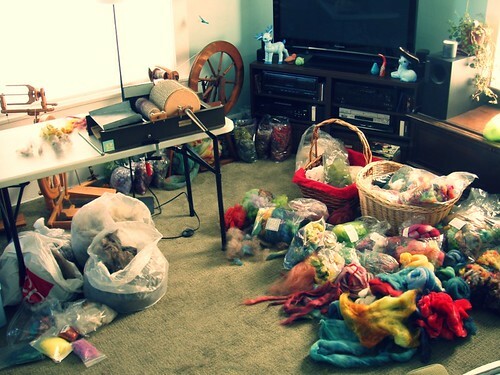 The entire jumbo bobbin had been filled with yarn initially, so plying it was a slow process. Also, I realized too late that I may not have put in quite enough twist for plying. It ended up to be a very large skein and it gave me a break from the normal routine, so as far as I am concerned, it was a success. Now I hope someone buys this because I am still sick of pink. 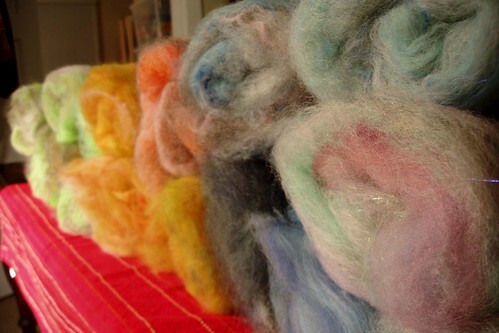 I spent two days last week working with my drumcarder, experimenting with color, texture, fiber. It was much more interesting than any other time I’d spent with Whiskers. The sandwich technique helped me to incorporate several different colors/fibers without overblending. I used to put one color through, than another, and card it again and again. It blended them quite effectively, but perhaps too much. Plus I wasn’t using high contrast colors. So they were nice, but not striking. I realized that, having an older machine with short teeth, I will never have those huge, lofty batts I’ve seen other places. It is what it is. Rich suggested layering a couple batts to get a heftier weight, since individually they are rather small. Also, I’ve been working on a few different tagging options. Along with the ribbon, I have a small, brief tag or a longer tag with more info. At this point I am not sure how I want to display these or label them. Suggestions? Smaller tag with logo only. 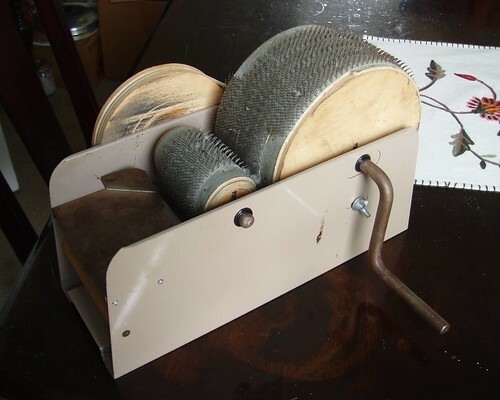 Several years ago, when I was in college, I was given an older Fricke drumcarder. It was being discarded by the university art department since they no longer had a fiber program. Someone rescued it for me and ever since it has haunted me. They usually cost$500-700 new, so to get one for free is amazing. However, I was intimated by it for a long time. I used it a bit at first, just making batts of a single color. Then I tried a bit of blending, but nothing too exciting. Seeing how popular art batts are right now, I wanted to try to make them, but I had no idea how to get there. 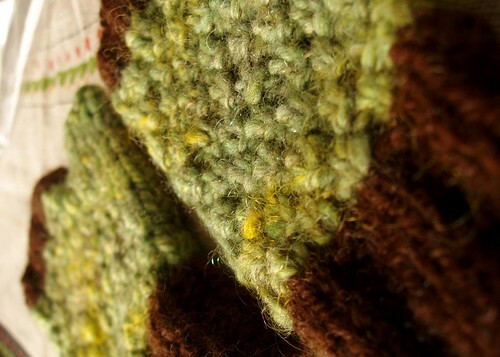 Until I came across a video on YouTube posted by Ashley Martineau of Neauveau Fiber Arts. 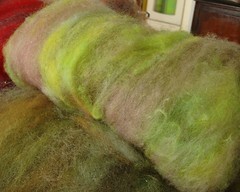 It talked about making a “sandwich” with the fibers and then sending it through the carder. Of course, mine aren’t nearly as thrilling as the ones she makes, but generally I’m excited to be making these and more importantly, using my drumcarder! Question: Is there anything you have been intimated to try? How did you overcome your “fear” of it? Have you worked on anything new this week? What encourages you to try new things? Semester’s End Cardigan is finally finished!! I washed and blocked it without a huge amount of change, but I think it is a little roomier in the chest area. And just today I got the ribbon sewed onto the button band and cut out all the button holes. Sheesh. That was more tedious than knitting the thing! Next sweater is definitely a pullover. 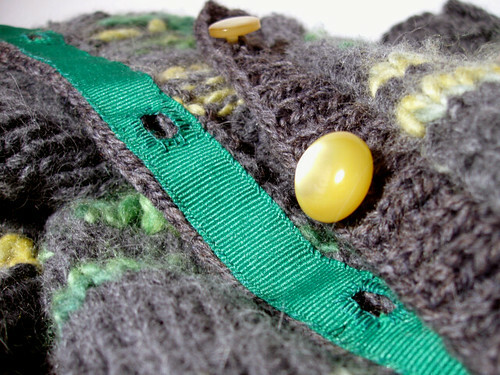 After learning the button hole stitch 5 years ago, I finally have a good reason to use it. Awesome! My new photography set-up seems to be quite successful, at least according to my standards. These are four new batts that were just added to my Etsy shop. 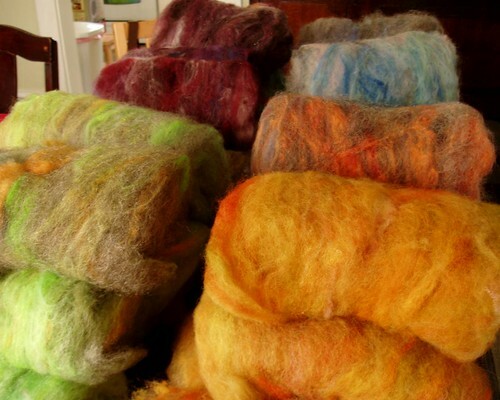 They are wool and mohair – so shiny! Total weight is 2 7/8 ounces. And the new locks I dyed on Monday were ready for a photo shoot too. These are called “Grapefruit” and will be added soon, along with “Wilted”, which can be seen in the flickr photostream. I wish I could sleep in this fleece. It is so soft and curly!